For other uses, see Abydos. Abydos (Arabic: أبيدوس‎; /əˈbaɪdɒs/ Sahidic Coptic: Ⲉⲃⲱⲧ Ebōt) is one of the oldest cities of ancient Egypt, and also of the eighth nome in Upper Egypt, of which it was the capital city. It is located about 11 kilometres (6.8 miles) west of the Nile at latitude 26° 10' N, near the modern Egyptian towns of el-'Araba el Madfuna and al-Balyana. In the ancient Egyptian language, the city was called Abdju (ꜣbḏw or AbDw). The English name Abydos comes from the Greek Ἄβυδος, a name borrowed by Greek geographers from the unrelated city of Abydos on the Hellespont. Considered one of the most important archaeological sites in Egypt, the sacred city of Abydos was the site of many ancient temples, including Umm el-Qa'ab, a royal necropolis where early pharaohs were entombed. These tombs began to be seen as extremely significant burials and in later times it became desirable to be buried in the area, leading to the growth of the town's importance as a cult site. Today, Abydos is notable for the memorial temple of Seti I, which contains an inscription from the nineteenth dynasty known to the modern world as the Abydos King List. It is a chronological list showing cartouches of most dynastic pharaohs of Egypt from Menes until Seti I's father, Ramesses I. The Great Temple and most of the ancient town are buried under the modern buildings to the north of the Seti temple. Many of the original structures and the artifacts within them are considered irretrievable and lost; many may have been destroyed by the new construction. Abydos was occupied by the rulers of the Predynastic period, whose town, temple and tombs have been found there. The temple and town continued to be rebuilt at intervals down to the times of the thirtieth dynasty, and the cemetery was used continuously. The pharaohs of the first dynasty were buried in Abydos, including Narmer, who is regarded as founder of the first dynasty, and his successor, Aha. It was in this time period that the Abydos boats were constructed. Some pharaohs of the second dynasty were also buried in Abydos. The temple was renewed and enlarged by these pharaohs as well. Funerary enclosures, misinterpreted in modern times as great 'forts', were built on the desert behind the town by three kings of the second dynasty; the most complete is that of Khasekhemwy. Panel from the Osiris temple: Horus presents royal regalia to a worshipping pharaoh. From the fifth dynasty, the deity Khentiamentiu, foremost of the Westerners, came to be seen as a manifestation of the dead pharaoh in the underworld. 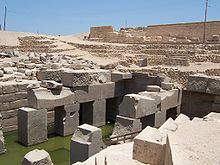 Pepi I (sixth dynasty) constructed a funerary chapel which evolved over the years into the Great Temple of Osiris, the ruins of which still exist within the town enclosure. Abydos became the centre of the worship of the Isis and Osiris cult. During the First Intermediate Period, the principal deity of the area, Khentiamentiu, began to be seen as an aspect of Osiris, and the deities gradually merged and came to be regarded as one. Khentiamentiu's name became an epithet of Osiris. King Mentuhotep II was the first one building a royal chapel. In the twelfth dynasty a gigantic tomb was cut into the rock by Senusret III. Associated with this tomb was a cenotaph, a cult temple and a small town known as "Wah-Sut", that was used by the workers for these structures. Next to that cenotaph were buried at least two kings of the thirteenth dynasty (in tombs S9 and S10) and some rulers of the Second Intermediate Period, such as Senebkay. An indigenous line of kings, the Abydos Dynasty, may have ruled the region from Abydos at the time. The building during the eighteenth dynasty began with a large chapel of Ahmose I. The Pyramid of Ahmose I was also constructed at Abydos—the only pyramid in the area; very little of it remains today. Thutmose III built a far larger temple, about 130 ft × 200 ft (40 m × 61 m). He also made a processional way leading past the side of the temple to the cemetery beyond, featuring a great gateway of granite. Seti I, in the nineteenth dynasty, founded a temple to the south of the town in honor of the ancestral pharaohs of the early dynasties; this was finished by Ramesses II, who also built a lesser temple of his own. Merneptah added the Osireion just to the north of the temple of Seti. Ahmose II in the twenty-sixth dynasty rebuilt the temple again, and placed in it a large monolith shrine of red granite, finely wrought. The foundations of the successive temples were comprised within approximately 18 ft (5.5 m). depth of the ruins discovered in modern times; these needed the closest examination to discriminate the various buildings, and were recorded by more than 4,000 measurements and 1,000 levellings. The latest building was a new temple of Nectanebo I, built in the thirtieth dynasty. From the Ptolemaic times of the Greek occupancy of Egypt, that began three hundred years before the Roman occupancy that followed, the structure began to decay and no later works are known. From earliest times, Abydos was a cult centre, first of the local deity, Khentiamentiu, and from the end of the Old Kingdom, the rising cult of Osiris and Isis. A tradition developed that the Early Dynastic cemetery was the burial place of Osiris and the tomb of Djer was reinterpreted as that of Osiris. Decorations in tombs throughout Egypt, such as the one displayed to the right, record journeys to and from Abydos, as important pilgrimages made by individuals who were proud to have been able to make the vital trip. Successively from the first dynasty to the twenty-sixth dynasty, nine or ten temples were built on one site at Abydos. The first was an enclosure, about 30 ft × 50 ft (9.1 m × 15.2 m), surrounded by a thin wall of unbaked bricks. Incorporating one wall of this first structure, the second temple of about 40 ft (12 m) square was built within a wall about 10 ft (3.0 m) thick. An outer temenos (enclosure) wall surrounded the grounds. This outer wall was thickened about the second or third dynasty. The old temple entirely vanished in the fourth dynasty, and a smaller building was erected behind it, enclosing a wide hearth of black ashes. Pottery models of offerings are found in these ashes and probably were the substitutes for live sacrifices decreed by Khufu (or Cheops) in his temple reforms. At an undetermined date, a great clearance of temple offerings had been made and a modern discovery of a chamber into which they were gathered yielded the fine ivory carvings and the glazed figures and tiles that show the splendid work of the first dynasty. A vase of Menes with purple hieroglyphs inlaid into a green glaze and tiles with relief figures are the most important pieces found. The noble statuette of Cheops in ivory, found in the stone chamber of the temple, gives the only portrait of this great pharaoh. The temple was rebuilt entirely on a larger scale by Pepi I in the sixth dynasty. He placed a great stone gateway to the temenos, an outer temenos wall and gateway, with a colonnade between the gates. His temple was about 40 ft × 50 ft (12 m × 15 m) inside, with stone gateways front and back, showing that it was of the processional type. In the eleventh dynasty Mentuhotep I added a colonnade and altars. Soon after, Mentuhotep II entirely rebuilt the temple, laying a stone pavement over the area, about 45 ft (14 m) square, and added subsidiary chambers. Soon thereafter in the twelfth dynasty, Senusret I laid massive foundations of stone over the pavement of his predecessor. A great temenos was laid out enclosing a much larger area and the new temple itself was about three times the earlier size. The temple of Seti I was built on entirely new ground half a mile to the south of the long series of temples just described. This surviving building is best known as the Great Temple of Abydos, being nearly complete and an impressive sight. A principal purpose of the temple was that of a memorial temple to the king Seti I, as well as reverence of the early pharaohs, which is incorporated within as part of the "Rite of the Ancestors". The long list of the pharaohs of the principal dynasties—recognized by Seti—are carved on a wall and known as the "Abydos King List" (showing the cartouche name of many dynastic pharaohs of Egypt from the first, Narmer or Menes, until his time)- with the exception of those noted above. There were significant names deliberately left out of the list. So rare as an almost complete list of pharaoh names, the Table of Abydos, rediscovered by William John Bankes, has been called the "Rosetta Stone" of Egyptian archaeology, analogous to the Rosetta Stone for Egyptian writing, beyond the Narmer Palette. There also were seven chapels built for the worship of the pharaoh and principal deities, being the "state" deities Ptah, Re-Horakhty, and (centrally positioned) Amun-Re; the remaining three chapels are dedicated to the Abydos triad of Osiris, Isis and Horus. The rites recorded in the deity chapels represent the first complete form of the Daily Ritual, which was performed throughout temples daily in Egypt throughout the pharaonic period. At the back of the temple is an enigmatic structure known as the Osireion, which served as a cenotaph for Seti-Osiris, and is thought to be connected with the worship of Osiris as an "Osiris tomb". It is possible that from those chambers led out the great Hypogeum for the celebration of the Osiris mysteries, built by Merenptah. The temple was originally 550 ft (170 m) long, but the forecourts are scarcely recognizable, and the part still in good condition is about 250 ft (76 m) long and 350 ft (110 m) wide, including the wing at the side. Magazines for food and offerings storage were built to either side of the forecourts, as well as a small palace for the king and his retinue, to the southeast of the first forecourt (Ghazouli, The Palace and Magazines Attached to the Temple of Sety I at Abydos and the Facade of This Temple. ASAE 58 (1959)). Except for the list of pharaohs and a panegyric on Ramesses II, the subjects are not historical, but religious in nature, dedicated to the transformation of the king after his death. The temple reliefs are celebrated for their delicacy and artistic refinement, utilizing both the archaism of earlier dynasties with the vibrancy of late 18th Dynasty reliefs. The sculptures had been published mostly in hand copy, not facsimile, by Auguste Mariette in his Abydos, I. The temple has been partially recorded epigraphically by Amice Calverley and Myrtle Broome in their 4 volume publication of The Temple of King Sethos I at Abydos (1933–1958). The adjacent temple of Ramesses II was much smaller and simpler in plan; but it had a fine historical series of scenes around the outside that lauded his achievements, of which the lower parts remain. The outside of the temple was decorated with scenes of the Battle of Kadesh. His list of pharaohs, similar to that of Seti I, formerly stood here; but the fragments were removed by the French consul and sold to the British Museum. A rare etched carnelian bead found in Abydos, tomb 197, thought to have been imported from the Indus Valley Civilisation through Mesopotamia, in an example of Egypt-Mesopotamia relations. Late Middle Kingdom of Egypt. London, Petrie Museum of Egyptian Archaeology, ref. UC30334. The royal necropolises of the earliest dynasties were placed about a mile into the great desert plain, in a place now known as Umm El Qa'ab "The Mother of Pots" because of the shards remaining from all of the devotional objects left by religious pilgrims. The earliest burial is about 10 ft × 20 ft (3.0 m × 6.1 m) inside, a pit lined with brick walls, and originally roofed with timber and matting. Others also built before Menes are 15 ft × 25 ft (4.6 m × 7.6 m). The probable tomb of Menes is of the latter size. Afterward the tombs increase in size and complexity. The tomb-pit is surrounded by chambers to hold offerings, the sepulchre being a great wooden chamber in the midst of the brick-lined pit. Rows of small pits, tombs for the servants of the pharaoh surround the royal chamber, many dozens of such burials being usual. Some of the offerings included sacrificed animals, such as the asses found in the tomb of Merneith. Evidence of human sacrifice exists in the early tombs, such as the 118 servants in the tomb of Merneith, but this practice was changed into symbolic offerings later. By the end of the second dynasty the type of tomb constructed changed to a long passage bordered with chambers on either side, the royal burial being in the middle of the length. The greatest of these tombs with its dependencies, covered a space of over 3,000 square metres (0.74 acres), however it is possible for this to be several tombs which have met in the making of a tomb; the Egyptians had no means of mapping the positioning of the tombs. The contents of the tombs have been nearly destroyed by successive plunderers; but enough remained to show that rich jewellery was placed on the mummies, a profusion of vases of hard and valuable stones from the royal table service stood about the body, the store-rooms were filled with great jars of wine, perfumed ointments, and other supplies, and tablets of ivory and of ebony were engraved with a record of the yearly annals of the reigns. The seals of various officials, of which over 200 varieties have been found, give an insight into the public arrangements. The cemetery of private persons began during the first dynasty with some pit-tombs in the town. It was extensive in the Twelfth and Thirteenth dynasties and contained many rich tombs. A large number of fine tombs were made in the Eighteenth to Twentieth dynasties, and members of later dynasties continued to bury their dead here until the Roman period. Many hundreds of funeral steles were removed by Auguste Mariette's workmen, without any record of the burials being made. Later excavations have been recorded by Edward R. Ayrton, Abydos, iii. ; Maclver, El Amrah and Abydos; and Garstang, El Arabah. Some of the tomb structures, referred to as "forts" by modern researchers, lay behind the town. Known as Shunet ez Zebib, it is about 450 ft × 250 ft (137 m × 76 m) over all, and one still stands 30 ft (9.1 m) high. It was built by Khasekhemwy, the last pharaoh of the second dynasty. Another structure nearly as large adjoined it, and probably is older than that of Khasekhemwy. A third "fort" of a squarer form is now occupied by a convent of the Coptic Orthodox Church of Alexandria; its age cannot be ascertained. The retouched and eroded hieroglyphs in the Temple of Seti I which are said to represent modern vehicles – a helicopter, a submarine, and a zeppelin or plane. Some of the hieroglyphs carved over an arch on the site have been interpreted in esoteric and "ufological" circles as depicting modern technology. The carvings are often thought to be a helicopter, a battle tank or submarine, and a fighter plane (some interpret this as a U.F.O.) However, these conjectures are largely based in pseudoarchaeology, and the picture often claimed as "evidence" has been retouched (see right). ^ "Tombs of kings of the First and Second Dynasty". Digital Egypt. UCL. Archived from the original on 6 January 2008. Retrieved 2008-01-15. ^ Misty Cryer (2006). "Travellers in Egypt – William John Bankes". TravellersinEgypt.org. Archived from the original on 2016-08-14. ^ "Abydos town". Digital Egypt. UCL. Archived from the original on 4 January 2008. Retrieved 2008-01-15. ^ a b c d e Chisholm 1911, p. 81. ^ "The Funerary Enclosures of Abydos". Digitial Egypt. UCL. Retrieved 2008-01-15. ^ a b c d e f g h i j k l Chisholm 1911, p. 82. ^ Petrie, Abydos, i. and ii. ^ Chisholm 1911, pp. 81-82. ^ Misty Cryer, "Travellers in Egypt – William John Bankes" (2006), TravellersinEgypt.org, web: TravEgypt-WJB Archived 2006-08-30 at the Wayback Machine: re-discovered Table of Abydos. ^ Petrie, Royal Tombs, i. and ii. ^ Mariette, Abydos, ii. and iii. ^ ""Helicopter Hieroglyph" Explained!". tripod.com. This article incorporates text from a publication now in the public domain: Chisholm, Hugh, ed. (1911). "Abydos" . Encyclopædia Britannica. 1 (11th ed.). Cambridge University Press. pp. 81–82. Ayrton, Edward Russell; William Matthew Flinders Petrie (1904). Abydos. iii. Offices of the Egypt Exploration Fund. Harvey, Stephen (Spring 2004). "New Evidence at Abydos for Ahmose's funerary cult". Egyptian Archaeology. EES. 24. Murray, Margaret Alice; Joseph Grafton Milne; Walter Ewing Crum (1904). The Osireion at Abydos. ii. and iii. (reprint edition, June 1989 ed.). B. Quaritch. ISBN 978-1-85417-041-5. Wilkinson, Toby A. H. (1999). Early Dynastic Egypt. Routledge. Mariette, Auguste, Abydos, ii. and iii. William Flinders Petrie, Abydos, i. and ii. William Flinders Petrie, Royal Tombs, i. and ii. Wikivoyage has a travel guide for Abydos. 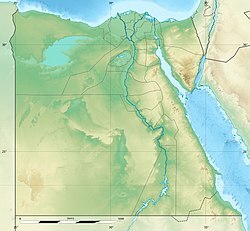 Wikimedia Commons has media related to Abydos. "Abydos". Digital Egypt. UCL. Archived from the original on 15 January 2008. Retrieved 2008-01-15.